[miau] Based on the biblical story of ‘Noah’s Ark’ – who surely took a gamble himself – IGT’s Noah’s Ark is a 5 reel video slot. Apart from the fact that the game’s divinely inspired theme may be off-putting to some players, this slot is both interesting and fun. The game is certainly appealing to players looking for entertainment as much as big wins. The game play has 30 lines and the return to player is 93.04% – 94.93%. The video slot offers free spins, double-prize icons and scatter and wild symbols. The jackpot of this video slot is a 500,000 maximum. IGT’s Noah’s Ark is not a highly volatile slot like Great Blue, but is instead a simple game that plays similarly to IGT’s Cats slot. 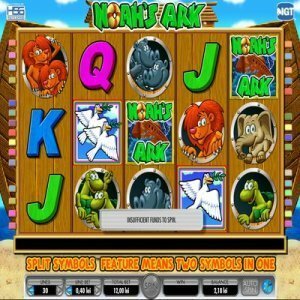 Playing off the original Noah’s story, this video slot has a pair of symbols for each animal – one for the animal by itself and a second symbol depicting the animal with its mate. The brightly colored cartoon animals move in celebration when you line up a win. Placing a bet entails selecting lines and line bets. One coin can be bet on each pay line. The combination of single animals, double animals and scatter symbols (both single and doubles) make a 10-symbol pay line possible. IGT’s Noah’s Ark video slot was among the earliest online video slots to utilize the split symbols feature. The term ‘split symbols’ refers to the use of the double animal icons. The wild symbol for Noah’s Ark video slot game is a depiction of the boat – Noah’s Ark. The wild icon can substitute for every other symbol but the dove symbol. The dove represents the scatter icon. The Ark symbol doubles any win already standing with the other animal icons. Animals pictured with their mates are worth double the prize of the single animals. As mentioned earlier, doves are the scatter symbol. Doves also come in doubles or singles. Doves with their mates count as two while a single dove counts as one. The Raining Free Spins Bonus game is triggered by the appearance of the scatters. The doves must present themselves only in the second, third and fourth reels to lay claim to the Raining Free Spins Bonus. The bonus is activated by the presence of five or more doves. Five doves awards five free spins. Six or more doves earns you ten free spins. Understanding the dove placement is the key to the scatter system. It can be frustrating to see five doves on the screen only for play to continue without the bonus. However, IGT’s Noah’s Ark video slot is unusual in that players are not dependent upon receiving free spins to profit from the game. As it is, players who select this game can expect to win a modest sum. Pay line wins are earned by calculating the number of animal matches on each pay line – not the number of symbol matches. As few as three animal icon matches earns you a win. Massive wins accompany ten animal matches. IGT’s Noah’s Ark video slot has a house edge between 5.07% and 7.95%. This game can be found in both online casinos and land-based casinos.